The New Black Handle Rubber Hex Dumbbells will look great in any gym. Rubber Coated Hex Black Handle Dumbbells are the perfect solution for achieving a full body workout. Made from solid cast iron with a 6-sided anti-roll design and cased in a durable rubber outer. Prevent damage to floors and equipment. Not only does it make the dumbbell look more professional, but the rubber hex doesn’t have a baked enamel finish to crack or chip like a regular hex dumbbell. Rubber hex dumbbells are more expensive than the basic hex, but the benefits of the rubber hex far out way the difference. The new version now comes with a black handle. 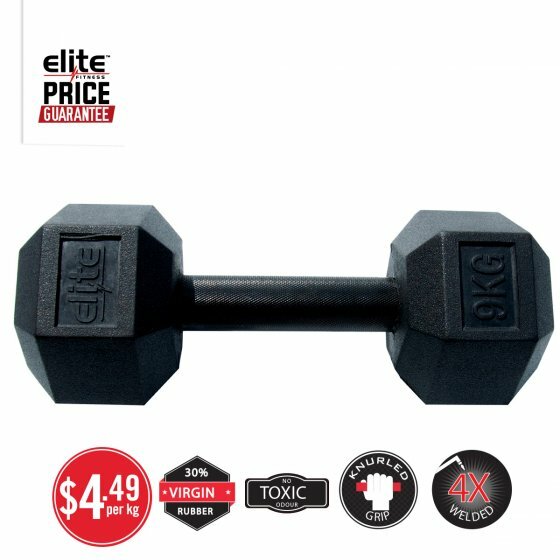 These Rubber Hex Dumbbells are made with virgin rubber to remove the impurities and take out the strong odour that you might find in some of the other brands. The Ergonomic design on our rubber hex handles helps to reduce fatigue and maximize comfort. The diamond style knurling on the grips also helps to keep our rubber hex dumbbells from slipping out of your hands. The new design is slightly smaller so is denser and smaller in volume compared to the previous version.